Usually blonde-haired, twenty-something and played by Goldie Hawn or her daughter Kate Hudson, the free-spirited All-American waifs of romantic comedies past were famous for their ability to bewitch their straitlaced male counterparts into loosening up the grips on their lives as well as their neckties. But if you’ve ever wondered what happens to these feisty females twenty-years after their happily-ever-after segues into marriage, middle-age and the prospect of facing empty-nest syndrome while taking their oldest child on a college tour, look no further than the aptly named midlife comedy At Middleton. Launching headfirst into her against-type role as the aggressively eccentric Edith, actress Vera Farmiga is far more likable than the ticking time bomb she’s playing onscreen. Seemingly eager to sabotage and steal focus from the lackluster tour of the picturesque tree-lined college that her over-achieving daughter Audrey (played by Vera’s sister Taissa Farmiga) is dying to attend, Edith goes for the jugular from the moment she first exits the car. Whether she’s pretending to punch a woman in the back of the head or acting out in a variety of ways (from faux phone-throwing to temporary bike theft to lecture crashing), Edith decides to see just what exactly she will be getting for her forty-three grand per year investment in the span of one increasingly wild day. 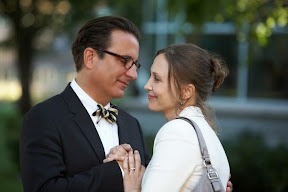 "Advocating tour hooky" alongside her is the requisite bowtie wearing uptight potential extramarital love interest embodied by Andy Garcia’s cardiac surgeon George Hartman. And yes, a heart man named Hartman is just one in a series of cutesy contrivances and implausible shenanigans that span the film’s one hundred minute running time. 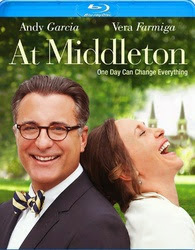 Needless to say, At Middleton requires a pretty large suspension of disbelief to buy into the premise that an uptight surgeon who showed no previous appreciation for humor, improvisation or impulsivity would suddenly embark on a hijinks filled afternoon of pot smoking and flirtation with the unstable Edith. Exceedingly well-cast, ultimately it’s a credit to the actors that you’re willing to keep watching the tonally all-over-the-place film. And this is especially true when Middleton meanders into disturbing territory that make you seriously question just how much screenwriters Adam Rodgers and Glenn German actually respect their female characters since both Farmiga sisters partake in some weirdly out-of-place emotional freak-outs as a like mother/like daughter pair of embarrassing basket cases that the males must placate. Hoping for screwball but settling for an existential midlife crisis dramedy, all in all it’s a manic depressive mixture of pleasant highs and gloomy lows that makes you upset by how much potential the film wasted given not only the affable actors but its otherwise clever premise and setting. While there are some truly beautiful moments including both clocktower scenes, a nice in-film tribute to Umbrellas of Cherbourg (which undoubtedly served as an influence) as well as an ironic twist for the prospective students in the otherwise fitting finale, ultimately it’s far too extreme in its unrealistic depiction of way too many characters on the verge of a nervous breakdown. Though it’s nice to see both its headliners embrace comedy, despite how much I really wanted to like the film, I’d still have to recommend Farmiga’s Oscar-nominated turn as a woman who finds herself at a crossroads in Jason Reitman’s much more realistic treatment of midlife coming-of-age Up in the Air before I'd suggest viewers take a tour of Middleton.